1. 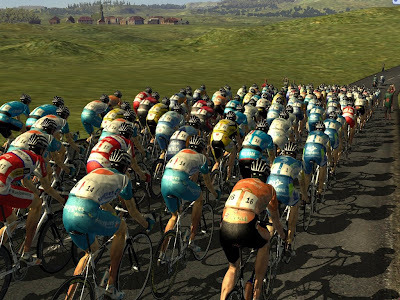 Pro Cycling Manager 2008, update to the PC based game developed by Cyanide Studios is scheduled to be released in June. The game is basically a sports simulation where you'll play as the general manager of one of 65 official cycling teams and will handle all aspects of a professional team's season. I don't play computer games these days apart from a little chess now and then, but when I did try some PCM in the past, it was with the 2006 edition. The game was so horrible back then that riding my trainer for 4 hours was more interesting, and not even marginally. 2. Tired? Bored of riding long miles? An interesting picture slapped onto the top tube of a TREK by an Ebay seller. He's been riding for 2 years, it seems, until he ended this fling. "So we won the TTT at the Giro, which is pretty cool. The next day things were going ok until a bottle bounced out of Millar’s cage and into my path. No big deal, I thought, just a bottle. But then, I hit the ground where the water had leaked and instantly slid out and crashed along with some others. For all the safety regulations the UCI comes up with, here’s one more suggestion - inspect the bottle cages. I know there are some bottle cages out there that can properly hold the bottles. Furthermore, are we drinking out of BPA laced bottles??" 4. Now I love kids, don't get me wrong. But now and then, when a little kid pops up in one of your road races, drafting effortlessly on a Walmart bike with the peleton at 28mph, you'll know you'd want to BE in a breakaway. Well, atleast after all the shock and awe on your face of course. A reader pointed me to a video similar to this nature. I think Gatorade does make kids fast. Check his water bottle, quick! 5. 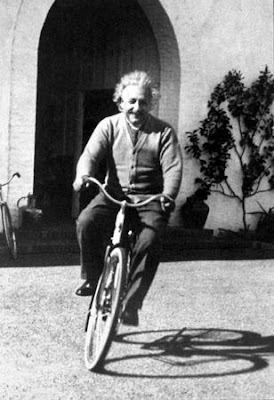 Even Einstein rode a bike to stimulate his brain. Now imagine the problems the scientific community would have had if he had crashed. We wouldn't be having E = MC^2!! So if you're an important person, wear a helmet. 6. 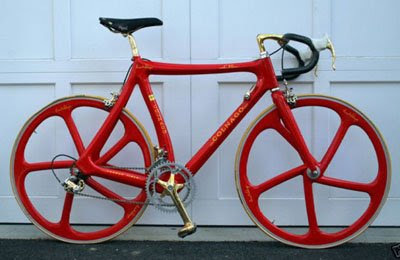 So after reading my post, James at Bicycle Design critiques the design of the Colnago C35 Collector's edition, making no secret of the fact that its 'whacked'. James, by the way, is an industrial designer so he probably knows shapes and looks better than most of us. So can one use the same standards used to judge a 'ridable' bike on one that's merely showpiece? Argue why or why not at his blog. I like that picture of Einstein. It makes me happy.